This episode, we have the international kungfu star Jackie Chan as Running Man guest. Perhaps because of this reason, the sequel about the origin of the Golden sword will be swop with this episode. Nonetheless, I had great expectation for this episode as this was the first time Running Man invited a foreign star. 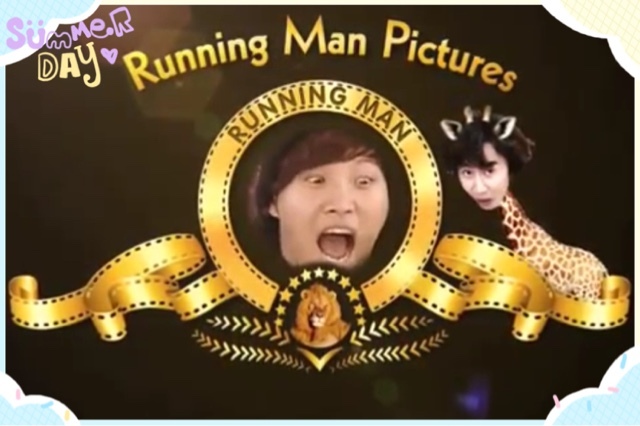 We started the show with the Running Man pictures. The theme of the mission is "Treasure Hunter". Most of them went to the restaurant because of hunger. Ji Hyo and Kwang Soo went straight to the hair salon and Kwang Soo ended up having a new hair style with a new prem. The Running Man members ordered some foods and the sharp commander Jong Kook noticed something weird about the waiter and the words that he said. He started to use the paper and the pencil and rolled it around. It turned out that his intuition was right and the paper showed the address of the next mission. Jong Kook shared his findings with the rest of the members. At first Jae Suk dismissed his findings but was soon convinced by him. Jong Kook and Haha board a cab immediately and headed straight to the destination. On the other hand, Ji Hyo noticed the hint “roll” after it was repeated by the salon stylist several times. Ji Hyo got the address for the next mission and left Kwang Soo behind in the hair salon. Kwang Soo was left clueless while Ji Hyo apologizes to him through the camera as she ran away. Jong Kook reached the destination first and was given a great advantage of getting the first dart for the final mission. The rest of the cast assembles and we saw the huge screen with Jackie Chan giving out the mission. The theme of the mission was to help Jakie Chan find his lost treasure. Surprisingly, Jackie Chan appeared right in front of them the next moment and the Running Man turned on the “fan mode” and started taking pictures with him. Big nose hyung even compared his nose and Jackie nose and witty Jackie replied that they are not the same. Ha. Jae Suk asked for Jackie phone number and he answered that he is not a woman and he turned to face Ji Hyo. However, the ever protective Gary intervened and decared that Ji Hyo was taken. Jackie Chan was surprisingly proficient in Korean and managed to understand simple conversations. Other than Jackie Chan, there was another special guest and he is none other than Super Junior Siwon. Jackie Chan being the guest can chose two Running Man members to be his team members and he chose Ji Hyo and Jae Suk. The other members were disappointed especially Jong Kook who showed Jackie his muscular bicep but was rejected because he prefered brainy Jae Suk to brawn Jong Kook. Anyway, it was Siwon turn to choose and he chose Jong Kook his gym buddy and Gary to be his teammates. The remaining members were Kwang Soo, Haha and Ji Suk Jin and they made up the betrayal team. The first game was to throw the bottle cap on the table and try to reach the other end of the line which is near the edge of the table. Everybody was anticipating Jackie Chan throwing the bottle cap and he did fine although not the best. Gary was leading the bottle cap competition until Haha threw the bottle cap and pushed Jackie bottle cap forward towards the line before his bottle cap went out of the table. Thanks to Haha, Jackie and his team were the first and they headed straight to the rooftop and obtained a dart. The next game was to play skipping rope on the bumpy floor mat. Jackie team played the game first but failed. Jong Kook team joined them next and surprisingly Siwon and Jong Kook exclaimed that it was not painful when they stepped on the mat. They were given the nickname: Painless brothers by Jae Suk. The painless brothers skipped on the mat and asked Gary to join in but there was absolutely no space for him. Because of that they failed this round and Gary get a earful from Jong Kook. The betrayal team tried to use a different method to win, just as expected the effort was in vain. Eventually, they agreed to lessen the number of time they skip to five but the condition is to take out the socks when they jump. Commander Jong Kook made a mistake with the rope and everyone laughed while Jong Kook was embarrassed. Nonetheless, Jong Kook team managed to complete the mission first followed by Jackie team. The betrayal team was comical and keeps making Jackie laugh. The next game was to set a phone timer from 20 seconds to 2 minutes. They have to answer the questions asked by the person holding the phone. The person who still holds the phone when it rang will be eliminated. Jong Kook mercilessly set the timer to 20 seconds to the protest of the other Running Man. He ended up eliminating himself after he passed the timer to Ji Suk Jin and was later passed back to himself. The timer goes back and fro and Ji Suk Jin accidently eliminated his own team mate Kwang Soo due to some confusion. When Ji Hyo was asked if she will date Gary, she replied "Maybe" and Gary insisted to know is it a yes or a no. Before she coud reply, the phone rang. Therefore, the last two participants left to compete with each other were the witty Jackie and Si Won. In the end, Jackie won the game by passing the phone back to Siwon before it rang. The next game was located at the shopping Mall and the first group that find seven animals masks will win the game. There were lots of stealing from each team and it was funny how they stocked up the masks in their territory, while finding space to hide them from the enemies. Jackie Chan used some of his Kung Fu skill to fend off the “enemies” from the other camps. Jae Suk even jokingly slapped Kwang Soo when he tried to invade their territory by climbing up the ladder. Jong Kook cautiously packed all the masks in a bundle but all these were carefully observed by Jae Suk and he retorts that he was just 'cleaning up'. Jong Kook strikes a deal with the betrayal group that they will give them two darts if they win. Jong Kook team managed to gather seven animal masks and Kwang Soo could not hide his betrayal instinct as he tried to steal them under their nose. In return, Jong Kook smack him on the head as he fall to the ground laughing. The betrayal team however did not get any extra darts as the PD stated that they just helped aonther team. I like their reaction as they said, "Touch, Cross, Betray." The final game was to use all the darts to hit the golden zone and the first person who hits the gloden zone wins. Jackie Chan tried to aim for the golden zone but fall short of it. Everyone tried their best and did pretty well except for Kwang Soo who missed the shot completely. Finally, Siwon dart hits the golden zone and won the prize for his team but he graciously gave the golden boot to Jackie chan to the delight of everyone. For the closing speech, Jackie said," i love you " and blow kisses to everyone. In this episode, Jackie Chan portrayed a fun loving and witty person with lots of variety sense. I love the part when he was asked to guess how old is Kwang Soo, and he replied 45! I really admire Jackie wackiness and sense of humor. If i am part of the cast, my reaction will be the same as the Running Man too. Haha gazed at Jackie in a star-struck manner was cute. Jong Kook even assumed that Jackie is a Korean when he was young. This makes the Chinese feel proud to have Jackie as our action hero. I like the small games they were playing even though there is no nametag tearing, I still enjoyed the interactions of the cast. Especially the part where they snatched the animal masks, Kwang Soo being beaten twice and the betrayal team was so comical.